PVP, or Player vs. Player, is one of the two ways of gaining experience in the game; the other way is hunting. 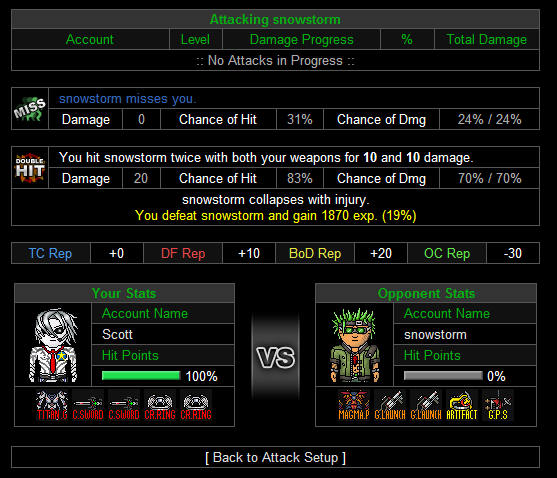 Ever since Double EXP was removed and Zorg made hunting inferior, PVP has been the more widely-used way of the two. PVP, compared to hunting, gives 125% as much experience (and vice versa, hunting gives 80% as much experience as PVP). This was one of the changes Zorg implemented in order for the game to be more PVP-oriented. To make sure you find healthy players, check 'Attackable Only' on Player Search. After you select 'Attack! ', you will be taken to a screen like this: remember, you can only defeat any specific player once per day and players that are in the process of attacking you. This shows all battle information from the last turn and yours and your opponents weapons and HP. Once you defeat the player, you get a set amount of experience depending on your level and how much lower/higher your opponent's level is. Sometimes, other players may defeat the player you're attacking before you can. In this case, you get assist damage, which is always less than 100% of the normal EXP. You can only defeat a player once a day. If you get assist damage attacking a player that counts as a defeat. If you attack a player but don't hit the player and someone else defeat that player you get no assist damage and no exp, and it dosen't count as a defeat and you can attack that player again without waiting a day. The equation used to work out the minimum level of players you can gain experience from is: Minimum opponent level = ROUND(Your level + 0.5) / 2 - 1. For example, if you are a Level 50 player, you can only gain experience from defeating players Level 24 or higher (since 50.5 rounds to 50, 50 divided by 2 is 25, and 25 minus 1 is 24). If you are a Level 65 player, you can only gain experience from defeating players Level 32 or higher (since 65.5 rounds to 66, 66 divided by 2 is 33, and 33 minus 1 is 32). Before the bank update, you could sometimes, if your opponent had credits on hand, get 25% of the credits when you defeated them. However, this is no longer true as this feature has been removed. 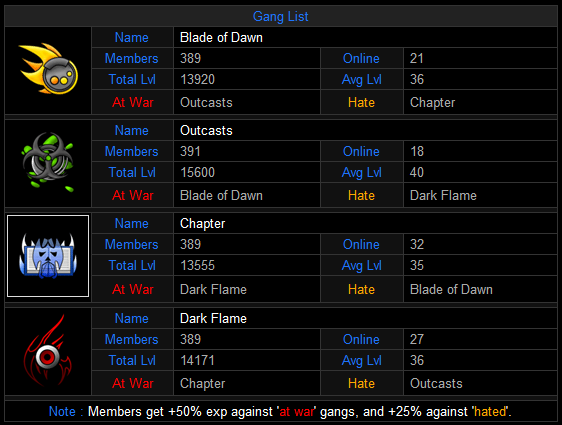 By defeating members of other gangs, you gain gang reputation points depending on which gang the player you defeated is from: you gain 5 points by defeating a member of a hated gang, and 10 points by defeating a member of the gang your gang is at war with. This page was last modified on 24 August 2010, at 20:53. This page has been accessed 10,842 times.